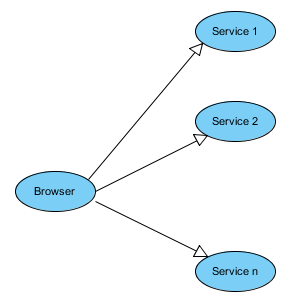 Do you surprise when I told you that there is a limit on how many parallel connections that a browser can make to the same domain? If you focus on the right side of the picture, you can notice that Chrome did a decent job of highlighting different kind of resources with different colours and also manage to capture the timeline of requests. Each comment and follower loaded will trigger avatar loading. So, in minimum you have 4 phases of loading webpage and each phase depend on the result of earlier phase. However, due to the limit of 8 maximum parallel requests, one phase can be split into 2 or more smaller phases as some requests are waiting for available connection. 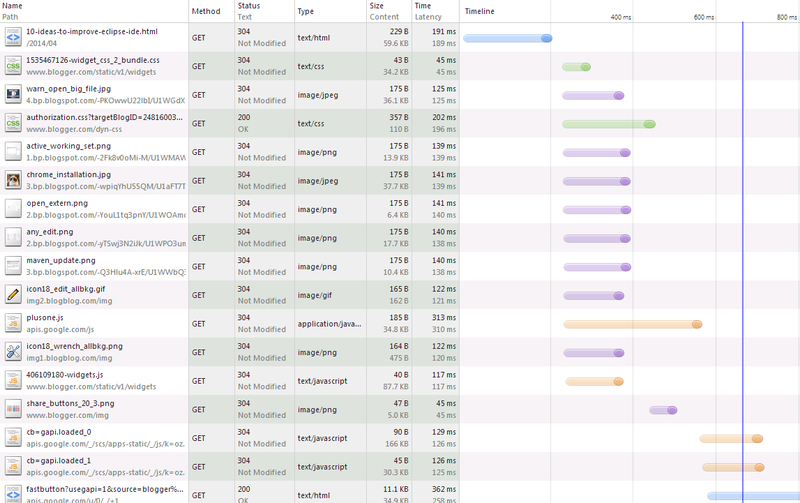 Imagine what will happen if this webpage is loaded with IE6 (2 parallel connections, or minimum 26 rounds of loading for 52 requests)? Why browsers have this limit? 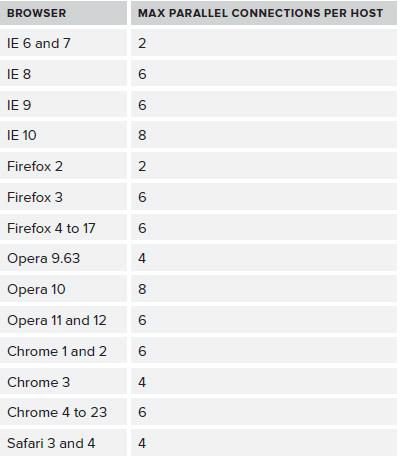 You may ask if this limit can have such a great impact to performance, then why don't browser give us a higher limit so that user can enjoy better browsing experience. However, most of the well-known browsers choose not to grant your wish, so that the server will not be overloaded by small amount of browsers and end up classifying user as DDOS attacker. How to handle this limit? Lack of control on Ajax requests cause more severe problem. I would like to share some sample of poor design that cause slowness on page loading. This approach is quite popular because it let user feel the progress of page loading and can enjoy some important parts of contents while waiting for the rest of contents to be loaded. There is nothing wrong with this but thing is getting worse when you need more requests to load content that the browser can supply you with. Let say if you create 12 Ajax requests but your browser limit is 6, in best case scenario, you still need to load resources in two batches. It is still not too bad if these 12 requests are not nesting or consecutive executed. Then browser can make use of all available connections to serve the pending requests. Worse situation happen when one request is initiated in another request callback (nested Ajax requests). If this happen, your webpage is slowed down by your design rather than by browser limit. 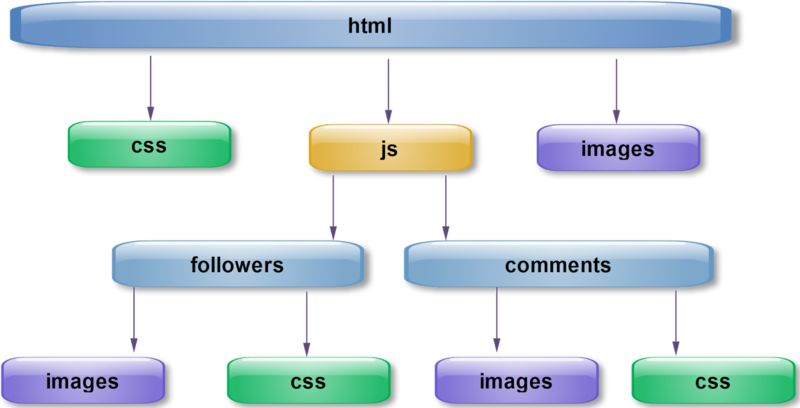 For most of Ajax requests, the response return JSON model of data. 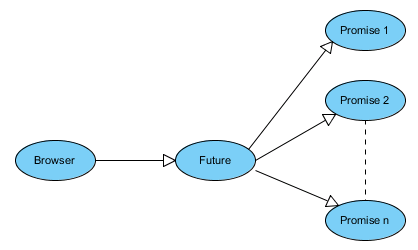 Then, the Knock-out framework will do the binding of html controls with models. We do not face the nested requests issue here but the loading time cannot be faster because of browser limit and many http threads is consumed to serve a single page load. One more problem is the lack of caching. The page contents are pretty static with minimal customization on some parts of webpages. This is even worse than original design. It is more or less equal to having the limit of 1 connection to server and all the requests are handled one by one. Each promise can be executed in a separate thread (not http thread) and the response is returned when all the promises are completed. We also apply caching to all of the services to ensure the service to return quickly. With the new design, the page response is faster and server capacity is improved as well. I have worked on a web application that make more than 10 Ajax requests when user change value of a first level combo box. Imagine what happen if user change the value of the combo box 10 times consecutively without any break in between? There will be 100 Ajax requests go to request queue and your page seem hanging for a few minutes. This is an intermittent issue because it only happen if user manage to create Ajax requests faster than the browser can handle. The solution is simple, you have two options here. For the first option, forget about rich client application, refreshing the whole page to load new contents. To persist the value of the combo box, store it as a hash attached to the current URL address. In this case, browser will clear up the queue. The second option is even simpler, block user from making change to combo box if the queue is not yet cleared. To avoid bad experience, you can show the loading bar while disabling the combo box. Assume the world have 5 continents, then you spawn 1 + 5 = 6 requests. This is not necessary as you can return a complex data structure that contain all of these information. Making requests is expensive, making nesting request is very expensive, using Facade pattern to get what you want in a single call is the way to go.